Size: 110 hectares of beach and coast and 5,400 hectares of sea. Distance from San José: 192 kilometers. Ballena National Park is one of Costa Rica's newest national parks, created in an attempt to conserve some of the marine resources of the South Pacific region, which are under siege from over fishing and unchecked tourism development. Bordered on the south by Punta Piñuela, then extending out to sea for 9 kilometers, heading north 6 kilometers before coming back to shore at Punta Uvita in the southern end of Playa Hermosa, the park is ideal for scuba diving and beachcombing activities as it includes open ocean, islands and long, wide beaches. 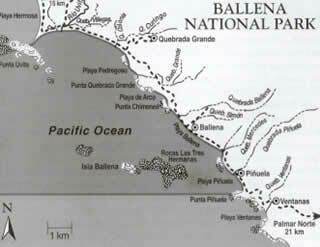 Several species of whales have been reported in or near Ballena National Park, which gets its name from the Spanish world for whale, "ballena". Melon-headed whales, sperm whales, as well as common stripped and spinner dolphins are regularly spotted. More species are sure to be recorded here, as more complete studies are under way. Ballena National Park is bordered on the south by Punta Piñuela, and extends out to sea for 9 kilometers, heading north 6 kilometers before coming back to shore at Punta Uvita, in the southern end of Playa Hermosa.